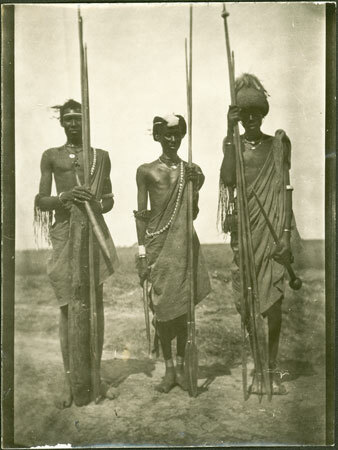 Three men posed for the camera holding spears and clubs, wearing textiles and arm and neck ornaments. Two are wearing headdresses of differing types as well as a long-fringed leather arm bands. Note on print reverse ms pencil - "SS overall & RCS 8.89"
Morton, Chris. "Three Shilluk men" Southern Sudan Project (in development). 03 Jan. 2006. Pitt Rivers Museum. <http://southernsudan.prm.ox.ac.uk/details/1998.348.17/>.